And Jabez called on the God of Israel, saying, Oh that thou wouldest bless me indeed, and enlarge my coast, and that thine hand might be with me, and that thou wouldest keep me from evil, that it may not grieve me! And God granted him that which he requested.” There is a saying that whatever you do will always come back to you. There are times when I have to remember that for every action there is an equal and opposite reaction, this is what we call karma. Understanding karma gives me the map of what I call the laws of life. Knowing what I know now there are some things I will not do. I will do good to all the people I can in all the ways I can, I will not lift my hand or use any of my six senses to harm anyone knowingly. I pray the prayer of Jabez daily. I negate every action that has created karmic debt for me, for which I am unaware of. Please allow me to share one of life’s lessons with you. A friend of mine had a room that she was renting; she hadn’t been there for a while so she went there and they had broken in and stolen her surround sound. She decided to call the electric company to let them know that the people at the home were stealing light. She dialed the number from her phone and there was a long wait time. She told me that she wanted me to call them; I told her no. she felt some type of way about that. What she doesn’t understand is in my law book, that is an evil act and I do not and will not carry any karmic debts for these actions. That would in no way fall on my shoulder or my kids. Reaping what you sow is a reality in life, it may not come back to haunt you now, however, when judgment comes it will. 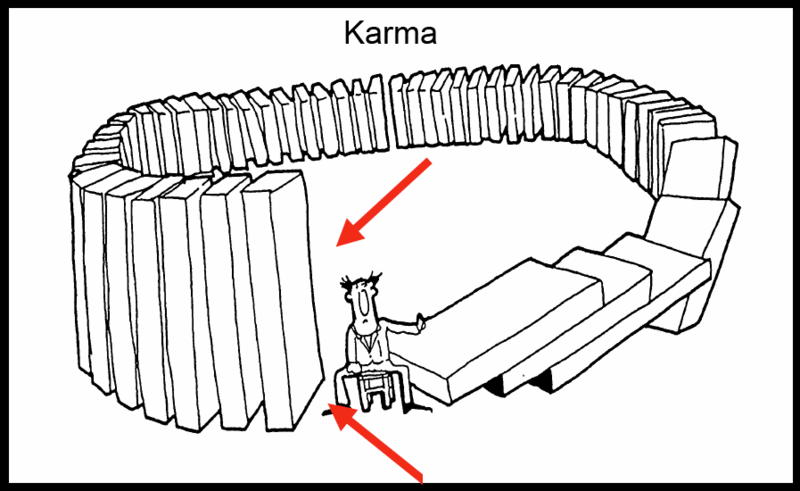 Karma is a meting out of justice. You will indeed receive a reward for your good deeds and punishment for the bad. This is a fact. This friend of mine at the young age of twenty-two is already feeling the effects of dark deeds done in past lives as well as this one. She, being very vindictive is setting up herself for a very long hard life in this incarnation. She doesn’t live anywhere and is doomed to go from place to place never settling. She will not find the good reactions because her actions are based on negativity. When the day comes that she takes a good look at what her main objectives have been and starts to correct these attitudes she will find a better way. Until then, she is set up to repeat her negative interactions. The Bible states that we are to turn the other cheek, I don’t believe in turning the other cheek, but I do believe in walking away and leaving some things to time. Three months ago, I set up my altar. Three months ago, I lost my job, I lost the man I was dating, and I felt depressed. This has caused me to be in a mental state of turmoil daily. I was worried about how I am going to live. I had already confirmed with a very good friend, that I would be coming to stay with her for a while, to get back on my feet. I told my landlord that I would move out actually today. Well, the same vindictive friend from paragraphs ago has been staying with me, for two months, without any rent. So my landlord has been very receptive to my plight. There have been times when I have felt that I am so close to the verge of giving up and I have had to shake off that negative energy trying to consume me. Two nights ago, I was home alone and I decided to pray and talk to my egguns and call out to the Lord. I asked for help, because I need it. Yesterday morning, my landlord called saying he was coming to see me. I haven’t seen my landlord in over a month. I started to tell him that I was getting ready to leave. My landlord told me to remember that he is the landlord and he is not telling me to go anywhere. I am to stay where I am and catch up myself. Then and there I gave thanks to my egguns, because daily there has been a cloud over my head and a fear of being homeless. I have spoken out loud and prayed, I do not want to lose my home and I do not want to dismantle my altar, because my egguns now have a home. You have to also be aware that it cuts both ways, there was a time when I myself, was very vindictive, which is an Aries trait. While growing up, my motto was vengeance is mine said the Lord, but I can’t wait. I had to grow out of that. I had and a mouth that would say scathing things to people that would cut like a knife and open wounds that would create karmic debts for me. It is correct to say that you can kill a person with words; any negative action creates a negative reaction that can begin to corrupt not just your daily life, but your aura and your future. I had a relationship that went on for many years, during which I would berate and belittle not just my lover, but also his significant other. This created a disaster for me, which I wasn’t even aware of. This man went and performed spiritual acts to hold me down and yes, he tried to destroy my life. He was able to do these things and get results because it was to be a lesson for me in understanding repercussions. I have reaped what I have sown; I created discord in their lives, so I have received discord in mine. Mi did depress fram mawning but now mi spirit liff…..
de landlord think ah him ah dweet, but ah yuh egunguns!, if yuh homeless whey dem ah go live!! sharlene from de ancestors are remembered and revered you shall never be disgraced!!! MI GLAD FI YUH !!!! !